Born at St John, New Brunswick on 8 May 1900, daughter of New Brunswick Premier Walter Edward Foster (1873-1947) and Joan Mary Vassie, she earned a gold medalist at Toronto’s Havergal College and graduated from McGill University with honours in English and History. 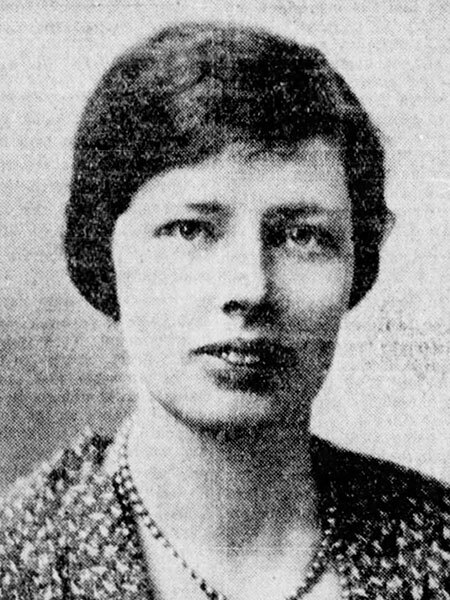 She was then Assistant Warden (1927-1928) at Royal Victoria College (RVC) at McGill University, earning her MA and Moyse Scholarship in 1925. She entered Sommerville College at Oxford University, attaining a BA and returned to McGill University as an assistant in the History Department as well as Residential Assistant and Librarian at RVC. In 1929, she came to Winnipeg on the recommendation of McGill University Chancellor Sir Arthur Currie and the request of J. A. M. Aikins to become Principal of the Riverbend School for Girls (1929-1934). She resigned in favour of further academic pursuits, and completed a Doctorate of Philosophy from Bryn Mawr College (1935) in Pennsylvania. She taught Bible and American history classes (1937-1940) at St. Agatha’s in New York and was Headmistress [Principal] (1940-1965) of Trafalgar School for Girls at Montreal, after which she retired on account of ailing health. “Riverbend Principal,” Winnipeg Evening Tribune, 22 June 1929, page 14. Birth registration, New Brunswick Vital Statistics. “New Riverbend School for Girls will open in Winnipeg, September 18,” Winnipeg Free Press, 22 June 1929, page 5. “New School for Girls to be opened in September,” Winnipeg Tribune, 22 June 1929, page 28. “Riverbend’s new enlargement is near completion,” Winnipeg Free Press, 16 August 1930, page 23. “Principal resigns,” Winnipeg Tribune, 23 April 1934, page 6. “Miss Joan Foster new Principal Trafalgar School,” Ottawa Journal, 13 April 1940, page 9. “Miss Joan Foster named Principal of Trafalgar School,” Winnipeg Tribune, 17 April 1940, page 9. “Joan Foster retires from Quebec school,” Winnipeg Free Press, 7 May 1965, page 30. “Traf: Quebec’s oldest English Girls’ School,” Heritage Quebec, Fall 2012 Vol. 6, No. 7. Biography [Walter Edward Foster], GNB.ca - Government of New Brunswick. Speakers of the Senate of Canada, Parl.gc.ca - Parliament of Canada.